Elegant spring blooming perennial that is very graceful, understated but beautiful. From rosette of lush leaves it sends up branched stems at the end of each is a soft primrose colored nodding flower from a madder red calyx. Wonderful. It remains in bloom and actually re-blooms from early April to early June. To 18″ tall in bloom and forming a patch several feet across. Full sun to part shade in rich, moisture retentive soil. Regular summer water is beneficial. Excellent and fun cut flower. 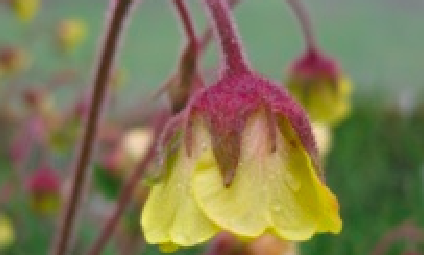 Adapted to clay soils as many Geums are and a great reason to grow them in Western Oregon. Winter deciduous.